1. branched like a tree. 2. pertaining to or possessing dendrites. 1. Of, relating to, or resembling a dendrite. 2. Of or relating to a dendritic cell. 1 treelike, with branches that spread toward or into neighboring tissues, as dendritic keratitis. 2 pertaining to a dendrite. 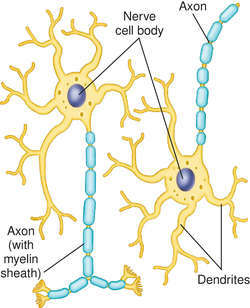 A dendrite of a neuron of autonomic ganglia that pierces the capsule surrounding the cell and extends for a considerable distance from the cell body. A dendrite of a neuron of autonomic ganglia that branches beneath the capsule of the ganglion, forming a network about the cell body. cells in lymph nodes participating in the provision of immune responses. region of the neuron subjected to excitatory and inhibitory stimulation. Researchers have shown that fresh dendritic cells can be introduced into the body in the form of a vaccine. In experiments using dendritic cells from elite controllers, from patients with progressing HIV infection, and cells from uninfected individuals, the investigators found a surprising difference. The exposure to inactivated HIV allows dendritic cells to deliver their message to white blood cells without harming them. The quantity of CDla positive dendritic cells after treatment in both groups showed elevated results compared to the quantity of CDla before treatment and the differences demonstrated statistical significance (Fig 1, Fig 2). Intra-abdominal follicular dendritic cel tumor in need of recognation. Dendritic growth in dissociated cultures of primary hippocampal neurons and in hippocampal slice cultures is similarly enhanced by PCB-95 but not by PCB-66 (2,3,4',4-tetrachlorobiphenyl), a congener with negligible effects on RyR activity. Key words: Cerebellum, Purkinje cell, dendritic spines, somatic configuration, ageing. Mocha ware also includes the sub category of dendritic slip ware. A dendritic spine is a small membranous protrusion from a neuron's dendrite that typically receives input form a single synapse of an axon, stores synaptic strength, and helps transmit electrical signals to the neuron's cell body. Some cell types, such as dendritic cells, release go signals while they show the "attack dog" cells characteristic pieces of the cancer cells--much like letting a bloodhound sniff a fugitive's socks.